Data can seem overwhelming because there is such a high volume of it. Our storage capacity has gone from megabytes to gigabytes to terabytes, all the way to geopbytes1. That said, business analytics (or business intelligence) is a newer concept. In fact, “Ninety percent of the data that exists today was created in the last two years alone.”2 So, just like any new technological advancement, businesses must learn how to adjust and utilize it to their benefit. Question is, how can your business leverage this overwhelming amount of data to gain insight to make important decisions? Take a second to imagine, instead of basing your business decisions on gut-feelings, instincts and assumptions -- you had concrete facts, data and research to back-up your decisions and help ensure success. 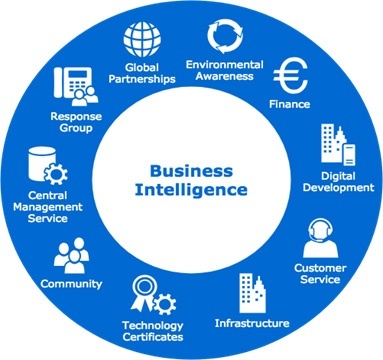 Since it is often difficult to fully understand what is happening in each aspect of the business, BI is used to help you see the bigger picture. How can it help your organization? BI can provide information on how to improve your customer service, help you deliver on promises and allow you to build long term customer relationships. Having strategies in place to accomplish these things is good, but BI allows you to personalize these strategies. BI prevents bottlenecking and problems in the fragile market by providing forecasts that can help you make good decisions at the right time, like purchases or hires. Society is becoming more fast-paced, and so are businesses. Decisions are being made faster, demand is increasing by the second and management teams are at the risk of making uninformed decisions, due to time pressures. Business Intelligence solves the challenge of making un-informed decisions. Your company most likely has the data you need to solve any challenges, but need help organizing and filtering the data to a manageable, easy-to-understand, usable level. That is where business intelligence comes in. To speak with someone at MCA Connect about business intelligence, contact us. Or contact one of our business transformation consultants to understand how you can achieve a strategic advantage in the market.